Posted November 27, 2018 by Patrick Sproull & filed under Headlines, News. As always there will be a festive – and yup, murderous – edition of EastEnders as the truth about Alfie and Hayley has catastrophic consequences for everyone involved. Additionally, there’ll be a big Christmas show for Michael McIntyre called, uh, Michael McIntyre’s Big Christmas Show as well as a couple of Yuletide episodes of Mrs Brown’s Boys. In terms of drama we’ve got mega Victor Hugo adaptation, Les Misérables, starring Dominic West, David Oyelowo, Lily Collins, Olivia Colman and more. Watership Down will be turned into a two part feature-length occasion, directed by Noam Murro and featuring the vocal talents of James McAvoy, Jon Boyega, Peter Capaldi, Daniel Kaluuya, Rory Kinnear, Craig Parkinson, Mackenzie Crook, Anne-Marie Duff, Taron Egerton, Jason Watkins, Ben Kingsley, Tom Wilkinson, Rosamund Pike, and Gemma Chan to boot. Mark Gatiss brought M.R. James’ The Tractate Middoth to life a few years back and this Christmas he’s written and directed his own spooky tale. The Dead Room follows Simon Callow as Aubrey Judd, the radio series’ veteran presenter and national treasure, who finds that he must adapt to changing times and tastes… But whatever happened to the classic ghost stories? The good old days? Aubrey soon discovers that all is not quiet in the eerie radio studio – and that elements of his own past are not as dead and buried as he perhaps hoped. Starring alongside Callow is Anjli Mohindra, Susan Penhaligon and Joshua Oakes-Rogers. There’ll be documentaries about comedian Billy Connolly, writer Andrew Davies and storyteller Raymond Briggs, and, of course, Doctor Who. 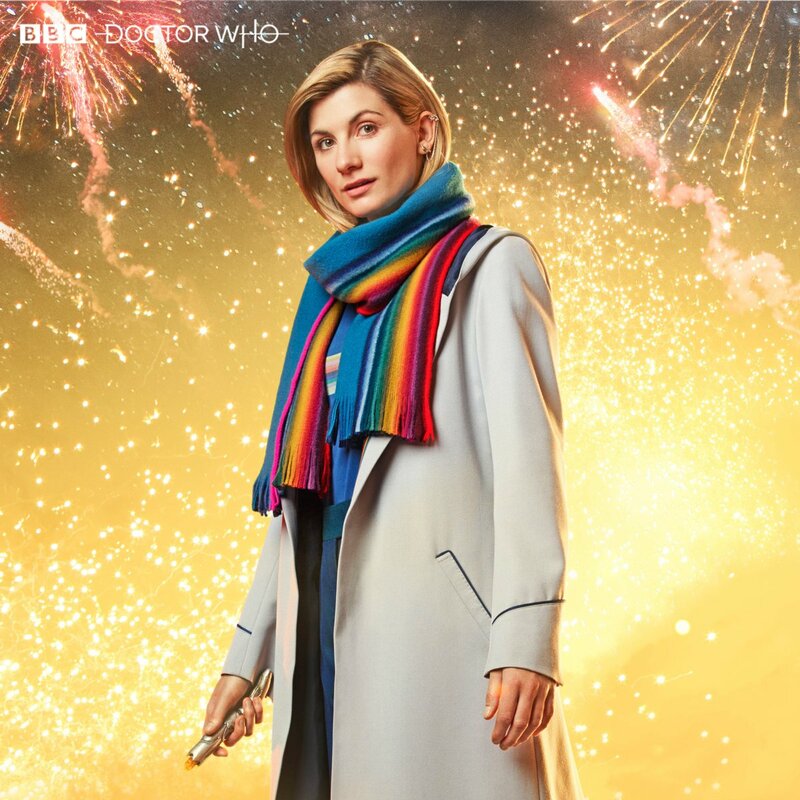 Jodie Whittaker will return to the title role alongside Tosin Cole, Bradley Walsh and Mandip Gill as Ryan, Graham and Yaz. As the New Year begins, a terrifying evil is stirring, from across the centuries of Earth’s history. As the Doctor, Ryan, Graham and Yaz return home, will they be able to overcome the threat to planet Earth? Whatever his next move, it will have devastating consequences for those around him — and change John Luther forever. Additionally, we’ll be seeing seasonal outings of Upstart Crow, Two Doors Down, Would I Lie to You?, Live at the Apollo, Mock the Week, QI, The Young Offenders, Not Going Out, The Graham Norton Show, Strictly Come Dancing and All Together Now feat. a celeb-tactic line-up that includes Gemma Collins, Chris Tamara, Alison Hammond, Laurie Brett, Ben Foden, Amber Davies, Omid Djalili, Sara Pascoe and Tyger Drew-Honey. We’ll give you air dates as and when we receive them. Tags: All Together Now, BBC, Call The Midwife, Christmas, DOCTOR WHO, Les Miserables, Live at the Apollo, Luther, Michael McIntyre's Big Christmas Show, Mock The Week, Not Going Out, QI, Strictly Come Dancing, The Dead Room, The Graham Norton Show, The Young Offenders, Two Doors Down, Upstart Crow, Watership Down, Would I Lie to You?